After graduating from the University of Florida, like most graduating students, Kristy Murphy wanted to do her best to find a job and become a viable working citizen. She found that job with a global shipping company and went to work in a 9-5 daily grind situation. While at work she would sneak peeks at surfing magazines and fantasize about living the dream as a professional surfer. After work, she and her friend Jenni Flanigan would surf the Jupiter, Florida inlet and hone in on the skills they thought necessary for them to join the elite group of international surfers on the long boarding circuit. Finally one day, after doing every East Coast surf comp they could enter, Kristy won the East Coast Surfing Championships. That was the moment Kristy and Jenni decided it was time to head to the West Coast, and give it a go against all the heroes they had been reading about in the surf magazines. The next day at work, Kristy quit her job and packed up all the gear they thought they needed into her 4x4 Jeep Wrangler and headed West, to San Diego. They were going to do it! They were going to become professional surfers!!! Once in San Diego, they surfed ALL the spots. Cardiff, Swami’s, Pipes, and Oceanside. These legendary surf breaks were where they spent most of their time surfing and learning from those very same heroes that they had read about. They had graduated from University and went right back to school getting a Master’s in surfing, with professors like Mary Bagalso, Linda Benson, the Ledingham Family, Kevin Shaughnessy and the boys up on “the Hill”, The Channin Surfboard and Glassing factory, which she worked for a while packing boards. She received an advanced course in the art of surfboard building from the best. She was also able to watch Joel Tudor and Donald Takayama surf, and not only watch them but talk story and hang out. Those San Diego days helped make Kristy the surfer she is today. At that time, she started entering contests on the West Coast, and was making the quarter finals regularly. During one of the Margaritaville Longboard Magazine events is when she met Cat Slatinsky, down in Imperial Beach, California. It was a series of 3 contests held in the San Diego area. Kassia Meador and Cat were planning to do a road trip down to Baja with a group of the pro longboard ladies, so Cat had flown in from Hawaii for the event. Everyone was going to stay at her parents’ house in Imperial Beach, to do the comp, then head down to Mexico, to shoot pictures and video for the magazines and sponsors. Kristy had come in 3rd place and was dying to tag along with the group of women surfers. That was the first trip Kristy and Cat worked together on and even though the Baja surf did not deliver much that trip, they all still had a great time getting lost, changing tires and eating lobsters straight from the local fisherman. Kristy liked working with Cat and had heard that she had a spot available in her room in Costa Rica, for the 2003 Women’s World Longboard Championships held at Boca Barranca. She roomed with Cat and Australian pro Melissa Combo. Once again, Kassia Meador and Cat were planning another photo/video trip down to Pavones, after the competition with a group of ladies who included Prue Jeffries, Melissa Combo, a young Jen Smith, and fellow photographer Jim Pidgeon. After coming in 7th place and winning a little prize money, Kristy was invited to come on the trip with the group of ladies to Pavones. It rained for an entire week and the swell never quite came through which really put a strain on the trip but Kristy and Cat continued to jive well together. Tired of waiting for swell, the rest of the group started back to Jaco beach while Kristy and Cat stayed it out and eventually scored PERFECT left point Pavones perfection all by themselves which pretty much sealed the deal for the working relationship that was starting to flourish between them. Also starting to flourish was the professional long boarding contest scene. There were quite a few events popping up around the world and the prize money was slowly getting better and better. Kristy, went to the Noosa Festival in Australia, the Longboard Magazine Series held in California, the China event held in Waikiki, and then the Women’s World Longboard Championships which was held that year in Huntington Beach, where Kristy came in 5th. As she moved forward Kristy could feel the momentum she was gaining as the next year she finally brought home the winner’s trophy beating all her heroes to become the 2005 Women’s World Longboard Champion at Ocean Beach, California. All the hard work and dedication to a life spent on the ocean as a Captain, a body boarder, and a surfer had paid off. Meanwhile, her career as a surf instructor was also starting to pay dividends. 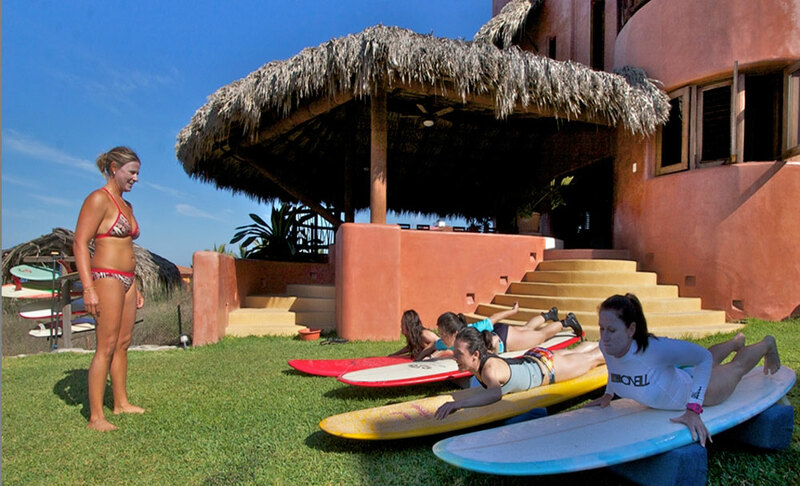 In the year 2003, Mary Bagalso had mentioned to Kristy that there was a surf company that was doing surf retreats down in Mexico, and that they needed surf instructors. Looking for a way to supplement her surfing career while at the same time giving her the time to work on her surfing, she took the job. 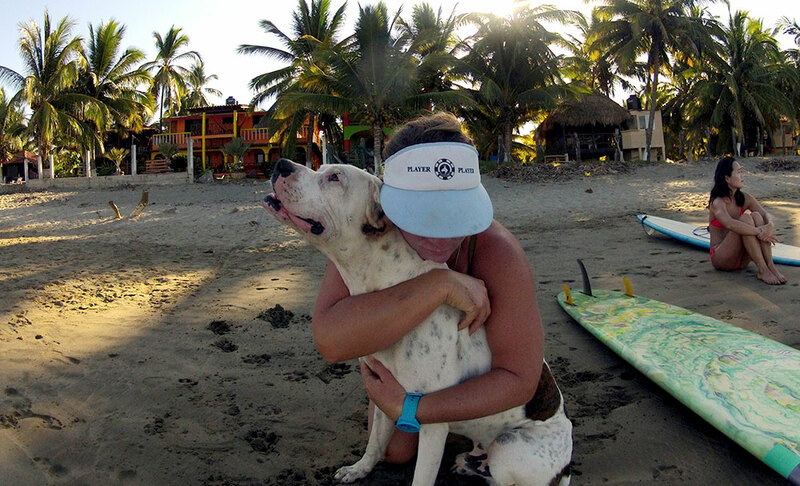 During her breaks, Kristy and her fellow instructors would take trips throughout Mexico, which not only helped her excel as a surfer but allowed her to visit the many surf spots that make Mexico one of the best surf destinations in the world. THAT is the year she first visited playa La Saladita, and fell in love with the best left point break in the country. Winning the World Championships solidified Kristy as a world class surfer which is why Robert “Wingnut” Weaver picked her up to work for him as a travel surf consultant for his “Go With A Pro” surf tours. With “Wingy” she learned the essence of what V.I.P surf travel was all about as she guided elite professionals around the globe on surf adventures. Cat Slatinsky took her first slide at Gator Beach in Coronado, California. Gator Beach is the beach the Navy uses to train potential SEAL team guys on the West Coast. At that time they were called FROGMEN. At 6 years old, after that first ride, she knew that was what she wanted to do…catch waves. In 4th grade she asked for a subscription to SURFER magazine for Christmas and a wetsuit. She didn’t get a wetsuit but she got the subscription. She was hooked on surfing AND now also hooked on surf photos. Her parents, who were not surfers, thought she was crazy but her brother knew she was onto something cool. In 6th grade she got the wetsuit and an old beat up G&S surfboard and started hitting the surf with her younger brother. At that time, there were no soft boards for learning, or surf coaches teaching proper technique, or internet for researching. Instead, there were a bunch of grumpy old mean guys yelling at groms, or worse if you were from the valley or out-of-state. In fact, there was only one girl in her town that surfed…that was Cat. As she grew older, Cat became more obsessed with surf photos and begged for a camera which she received as a teenager. It was on! The Bud Pro Tour was roaming around Southern California, and Cat couldn’t wait to hit the Imperial Beach pier with her brand new Chinnon 35mm camera to shoot Tom Curren, Occy, and a myriad of other 80’s pro short boarders. Surfing at that time was not viewed as a sport. It was more of a past time for bums that hung out on the beach. The consensus was that surfers didn’t have jobs and they did a lot of drugs. There wasn’t much of a future seen for surfers so Cat’s parents didn’t give surfing too much notice. Instead they saw softball as a more rational choice to invest in and they were right. Cat received a softball scholarship to Chaminade University of Honolulu. She had her choice of D1 schools but instead wanted to choose a school where she could surf her brains out and THAT is exactly what she did. Receiving a scholarship in Hawaii, brought her to the epicenter of contemporary surfing. On Oahu, is where Cat feels she really became a surfer. Longtime Waikiki Beachgirls Lori Saxman and Pinoi Makalena, amongst many others, took her in and taught her what it meant to be a surfer. Perry “Mooch” Fernandez, later became her surf coach and helped her surf bigger waves than she ever thought she could. Waikiki, in the 90’s was a special time. Uncle “Jamma” Kekai ruled the beach and Bobby Achoy and the Achoy family was inventing Stand Up Paddling. Bonga Perkins, Kalani Robb, and Megan Abubo were becoming stand out surfers… it was happening and Cat was lucky to be apart of it. In 1997, Cat’s good friend Ian Masterson asked her to join a little class he had been working hard to initiate at Windward College. 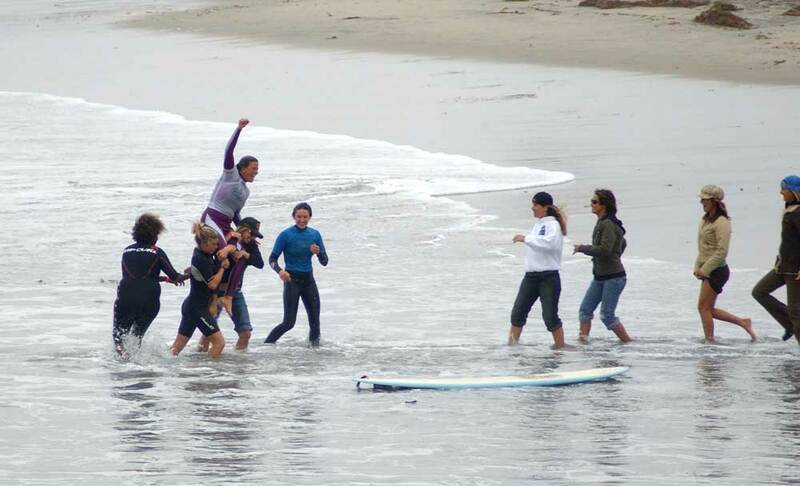 It was the first Surf Science class ever held in the United States, and it was awesome. That class had a huge impact on Cat. It gave her the courage to go out and buy her first video camera and begin her career as a surf videographer and photographer. She has shot an entire full length surf movie entitled “Heart,” starring Kassia Meador, Prue Jeffries, Keliana Woolsey, Melissa Combo and a great cast of other legendary women surfers. She also worked for Bill Ballard and Fuel TV, filming a variety of other surf flicks and shows. The most current movies she has contributed to are “Dulce” and “The Women and the Waves 2”. Cat’s surf photos have also been published in magazines and museums around the world. It was at this same time that Cat began surfing competitions. She joined the Hawaiian Longboard Federation and surfed local Hawaiian contests which led her to surf in the Women’s World Longboard Championships held in Costa Rica. On her first trip to Costa Rica, in the late 1990’s, for the Women’s World Longboard Championships, following the contest, Cat made the trek down to Pavones. There she fell in love with what she calls the best wave in Central America. The town wasn’t quite a town yet she recalls, but the wave and the rugged beauty of the jungle drew her in, which is why when people started asking Cat and Kristy to open up Costa Rica, they both new exactly the only place they ever wanted to be in Central America… Pavones. As former professional surfers Cat and Kristy inherently became professional travelers. Each of the destinations that they have chosen as traveling venues have been carefully chosen for quality of wave, culture, people, and food. They personally identify as well as have spent many years surfing at Pavones, La Saladita, and on Oahu. Although they offer special “once-a year” packages all over the world, including Peru, the Maldives, just to name a few, they have hand-picked these main 3 surfing beaches where they have spent more than a decade surfing at each spot as their main surfing headquarters. There is no doubt about it, when you are ready to let experience and excellence guide you on your next surf trip, Siren Surf Adventures shines above the rest.